When it comes to hamburgers, I am not really picky. Put some meat on a bun, add some lettuce and cheese and I will happily take care of it. However, that doesn’t mean I cannot recognise when the hamburger is worth to die for, and that is basically what you are going to find it here at Carl’s Junior. There are currently five Carl’s Jr. restaurants in Thailand: Sukhhumvit 24, Soi Thaniya, Nana Square, Central Festival Pattaya Beach and Mega Bangna. This review is based on the latest one, but you can expect a similar experience on the other branches. Carl’s Jr. at Mega Bangna is definitely easy to find: it is located on the ground floor, next to the main entrance called Mega Plaza. Should you have any doubt, a simple visit to Mega Bangna official site will clear it up. You can find more information about the other restaurants of this brand at Carl’s Jr. Facebook page. Yes, they still don’t have an official site for Thai Carl’s Jr.
Once in the restaurant, you will normally be greeted by a crew of half of dozen workers. Don’t expect them to have much english skills, but this will mostly depend on your luck. Nevertheless, don’t worry, as the panels with all the menu options plus the handy menu at the counter are going to help you to get those hamburgers to your stomach in no time. Unless McDonalds and other fast-food restaurants, you don’t need to wait at the counter. They will hand you a number to place on your table, and shortly someone will bring the order to you. Carl’s Jr. follows the trend of offering free refill of beverage: it’s up to you if you plan to refill your Coke until you explode. The choice of drinks includes the classics: Coke, Coke Zero and 7-Up, among others not-so-known-outside-Asia strawberry soda and some lemon tea. Something not so common you will find is the option to add as much lemon as you want, which can turn your Coke quite more interesting. At the counter they will only serve you the empty glass, so it’s your job to go to the refill machine and get whatever you want. On the same counter you will also find the ketchup dispenser, as on McDonalds and other well-known fast-food restaurants. Lastly, we came to the part that will make you want to come back: the food. 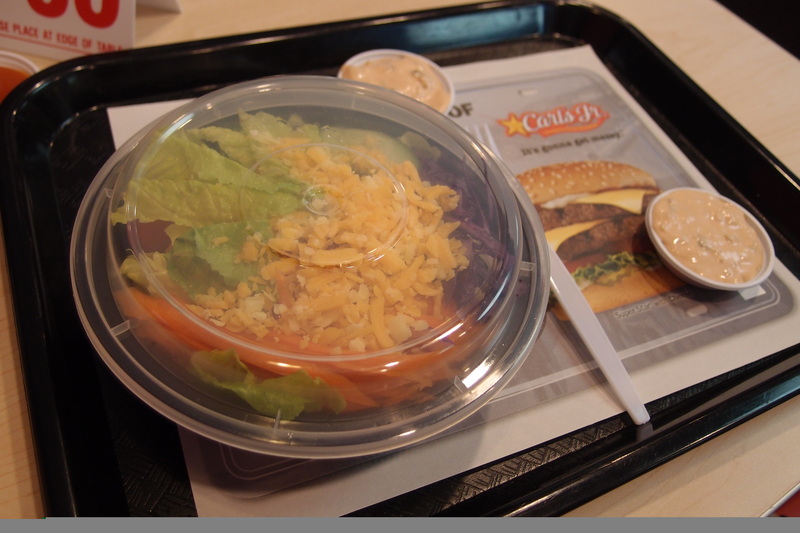 Carl’s Jr. menu is mainly hamburgers, but the salads and appetizers will probably also catch your attention. The name of the burgers are not really creative if you exclude Famous Star and Super Star. For the others: Portobello Mushroom Burger, Double Western Bacon Cheeseburger or Jalapeño Burger will not leave much for the imagination. Big Carl is basically a Big Mac or, better said, Big Carl is basically what they show you at the commercials of Big Mac. It’s juicy, the meat is not paper-thin and it comes loaded with lettuce and sauce. Prices for a burger varies from 85 THB for the cheapest one (Hand-Breaded Chicken Tender) to 225 THB for the meat loaded Double Western Bacon Cheeseburger. Adding french fries and a drink to it therefore turning it into a Combo- needs you to pay an extra 60 THB. But you can eat more than sandwiches here. Salad is available in two sizes: a normal Chairbroiled chicken salad priced 145 THB and a smaller side salad, still quite bigger of what you would expect. For appetizers, the chicken nuggets will probably surprise you if you expected them to be anything like that thing they serve at McDonalds. At Carl’s Jr. the nuggets are really tender chicken pieces served with honey mustard sauce. Also, don’t miss the different choices of french fries and onion rings, but be aware that some will add a fee to your combo. Considering the kind of food you will get, the price at Carl’s Jr. is very reasonable. Big Mac set in Thailand is around 160 THB, while a Big Carl combo with high quality fries and soft drink refill will cost you just 90 THB more. So, indulge yourself and give it a try. Afterwards, leave us a comment and tell us how was your experience and if you liked it as much as we did.